If you want to save some £s on your wedding venue, we’ve got a few tried and true tips for you to explore. There’s no doubt about it, wedding venues are pricey. In fact, the spaces you book for your ceremony and reception will probably be the biggest expenses of your celebration (check out this wedding cost breakdown). If you’re looking to save a bit of money without making too many sacrifices, we’ve got some advice for you. Here are a few money saving tips for your wedding venue. One tried and true ways to save money is to find a wedding venue that offers a package deal. Though it may look more expensive at the jump, not having to sort out separate catering, desserts, decor, flowers and more can really work in your budget’s favour. P.S. This will also save you the stress of finding all those suppliers on your own, and that’s priceless. While church ceremonies are definitely the most traditional option, more and more couples are hosting their wedding celebrations at alternative wedding venues. If you’re cool with saying your wedding vows in a more modern setting, look for a wedding venue that’s licensed for ceremonies and can host your reception, too. Having a space that serves double-duty means you won’t have to make two separate bookings and hire transportation to shuttle you between the two (leaving some extra £ in your bank account) . Keep in mind that you may have to book two rooms or spaces in the same wedding venue, but you’ll probably be able to snag a sweet deal for using the same supplier. 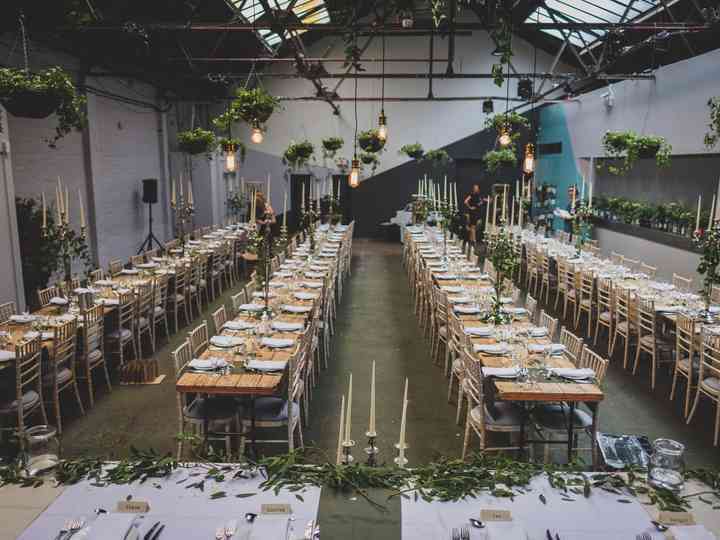 Speaking of alternative wedding venues, chic industrial spaces, modern lofts and restaurants are typically less expensive than grand ballrooms, so you may want to consider going with something a little “off the beaten trail”. Summer is the most expensive season to get married in the UK, so if you’re looking to save money on your wedding venue, you may want to consider looking for a date outside of June, July, August and September. While a dreamy outdoor wedding may not be in the cards for the colder months, there are plenty of ways to make early spring weddings, late autumn weddings and winter weddings just as epic. It’s typical for wedding ceremonies to begin in the afternoon and receptions to run late into the night. For those looking to save money on their wedding venues, shaking up this schedule is a good idea. Hosting an earlier, morning wedding and afternoon reception could shave a couple quid off of your venue rental fees as it may be less in-demand during these hours (definitely worth an ask!). Remember, you can always keep the party going at night with a trip to the pub or someone’s house/flat. The UK is filled with gorgeous small wedding venues and booking one will benefit your budget in the long run. Less people means less wedding favours, less mouths to feed and less space to decorate, so it’ll definitely have an effect on your bottom line.